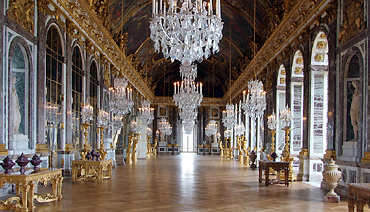 Our full day visit will allow you to have a full visit of the Versailles domaine. Besides of the traditional visit of the castle and the French style gardens, you will discover the “Grand Trianon Palace”, private residence of the king Louis XIV, and the “Petit Trianon” or Little Trianon palace, a place where Marie-Antoinette left her print. She spent a lot of time there, to get away from the “Etiquette”, way of living which didn’t let any intimacy to the royal family. Marie-Antoinette created there her English style garden and had built diferents buildings as the Love Temple, the Rock Pavillon, a theatre, and a medieval village where she used to go with her Ladies of honor dressed like a peasant to milk the cows or the goats. You will go from one place to another with a little train et you have the possibility of having lunch in a small restaurant along the grand canal. Paris-Versailles shuttle and special direct entrance ticket included. 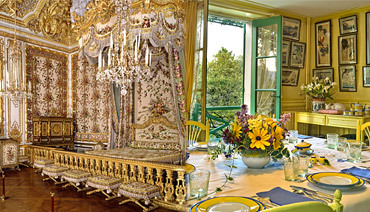 An exceptional packaged offer to discover two of the most famous sites around Paris : The house and gardens of Monet at Giverny and the Palace of Versailles. Priority access - No queue to buy your tickets ! PALACE VISIT WITH A QUALIFIED GUIDE : You can also choose the guided visit of Castle with our qualified guide. Our qualified guide will go with you inside the Castle and will comment exclusively for you the King's Grand Apartment, the Queen's chamber and the Hall of Mirrors, ... and many other marvels of the Castle.